SOAPware DocumentationSOAPware FAQ'sFAQ's SMARTextQ: How do I add a comment or free text to a structured item? 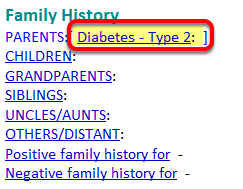 A: To add a comment to a structured SMARText item is referred to as "the click and type method". The click and type method does not work with medications. Left-click directly on top of the SMARText item the comment will be attached to. (Meaning, place your cursor within the SMARText item). 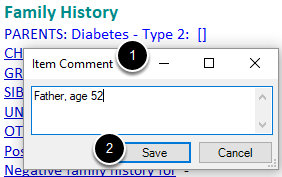 After left-clicking on the SMARText Item, start typing the desired comment. The comment box will not appear until you start typing. Click Save or press the Enter key on the keyboard. The free-text comment will now be "attached" to the SMARText item. To edit the comment, simply left-click on top of the comment, and press the spacebar on the keyboard. The Item Comment box will display, so that the comment can be edited. Previous Lesson: Q: How do I copy a SMARText item to create a neww one? Next Lesson: Q: How can I change the wording and appearance of SMARText in my documentation?